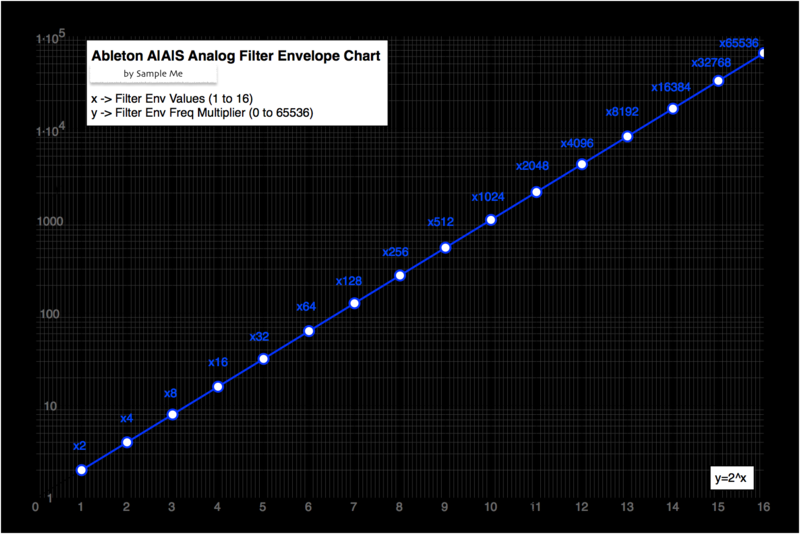 A maxforlive utility device to make weird calculations to scientifically setup AAS Analog Filter Env field. No sound output. No midi output. Midi thru. Probably you don’t need this one, but you will like it if you are reading Welsh’s Synthesizer Cookbook or similar stuff. 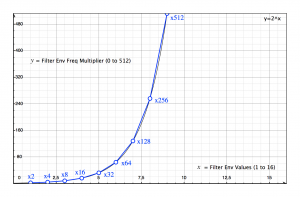 For example, if you want the filter to start at 50Hz, and open up to 3.2kHz, you have to calculate the right multiplier, the ratio between 3200/50 = 64. Then applying the above chart put a good 6 in the Analog Env field. With a negative value the filter Q will swing in the opposite direction (nice stuff). Use ‘Q to Env’ if you want to calculate the correct Env value, also useful to copy some patch from other synths to Analog. Use ‘Env to Q’ if you want to calculate the frequency end point (Q End), also useful to copy some Analog patch to other synths.